The hottest Android smartphones right now, the Samsung Galaxy S4 and HTC One, have just arrived on Google Play in their pure Google Editions, running on stock Android Jelly Bean without any skin on top of it. You can now pre-order the 16GB Galaxy S4 Google Edition (priced at $649.99) and the 32GB HTC One GE (priced at $599.99), and they are expected to ship on July 9th. The S4 GE and HTC One GE will work only on GSM carriers so you won’t be able to use them on Verizon and Sprint. Both will work fine on AT&T’s network, but if you want to make full use of T-Mobile’s network you’d better get the Galaxy S4 GE as it supports T-Mo’s full 3G/4G bands. The HTC One GE lacks T-Mobile's 1700MHz AWS bands and only supports the 1900MHz frequencies available in select areas. Good news is that if you buy one of the Google Edition smartphones you basically subscribe to timely Android updates that will be pushed over the air directly from Google without going through carrier approval. What's the difference between these phones and their non google edition counterpart? Lack of custom skins (pure jellybean) and lacks some of the innovations (S Beam, Zoe, Blinkfeed, etc...). Plus you get updates directly from Google. For the S4, the losses are all the innovations and Samsung tidbits. The gain is most likely a smoother, lag free experience, and more space available on built in storage. Got the One, you lose you mostly with Blinkfeed (which can largely be recreated anyway). The bigger loss is with the camera, which may not perform as well without the HTC tweaks. Thank you thank you thank you for noting the important parts -- specific unique hardware that was created for exclusive features to TouchWiz and Sense UI that may not work optimally with stock. It's designed as a developer device mostly, and I can only hope that with these out there, we can see more apps better optimized for Snapdragon 600. Btw, if u go to SAMSUNG S4's link to google, the feature list says "Snapdragon S4 Pro Processor" , not Snapdragon 600. But HTC ONE still has S600??!! They must of changed it because it says S600 now. 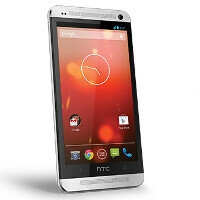 I can't WAIT for the Android 4.2.2 source for the HTC One Google edition, FINALLY comes out. That would help all the custom ROMS for the HTC Droid DNA & the HTC One because the #1 problem the developers are having is the Amp that is built it to these to phones can't be used. So the phones running custom ROMS right now can't take advantage of that KICKA$$ AMP. Soon, VERY soon the custom ROMS for BOTH the HTC Droid DNA & the HTC One will sound just as good as the Sense ROMS do. Can't WAIT! No manufacturer overlays/skins & no carrier bloatware = timely updates. EDIT: I meant this as a reply to comment #1. Extremely disappointing that these phones, in particular the HTC One Ge is not being made available in the UK at the same time. Worse still, no word on when it might be made available. Is Google copying HTC's marketing strategy (dumb and dumber) especially after the debacle that was the Nexus 4.......Shame on you Google! Disappointed? Not much, Grrrrrrrrrrrrrrr! You don't want that camera without Sense 5.0, anyway. Better off just buying one from your carrier now, or the unlocked version straight from HTC and installing a HTC 5 based ROM. Honestly, I think this is a case where the S4 really comes out ahead of the One. The S4 comes stripped of the rather bloated Touchwiz, which should do a lot to eliminate lag and stuttering, as well as lower the amount of used spaced on included storage. Most of the features lost are mostly gimmicky, and don't tie into hardware all that much. The One however, has a much smaller footprint with Sense 5, so the speed increase will be a lot less noticeable, and the savings on storage will also be smaller. The kicker though is that they have software tied into things like Beats and their camera, which will almost certainly mean for a different sound than the typical One, and potentially a difference in the camera. That could be a kicker. I personally prefer the One to the S4. But in this case, I think the Google Edition of the S4 provides a much better value than the standard version, and ends up being a better buy over the Google Edition of the One. I read somewhere that Beats audio will be intact don't know about the camera software. I think they did state that Zoe will be included in the HTC GE. Not fully sure though. It would definitely up my view on the One GE if Beats and Zoe made the cut. I'm somewhat skeptical, but I'd love to be proven wrong on that. Well I know beats is on there for sure, just not fully sure on Zoe -- though I know it still has the ultrapixel camera. If Beats is there then updates must be coming from HTC rather than Google, which muddies things a little. I'm curious about the camera if that's the case. If the software is pushed out by HTC rather than Google, then it is possible that you'd get the full experience from the ultrapixel camera. Anyone buying? for me both are expensive! @jove39 Wait till the holiday season, they always come down in price. Regardless, your correct they are overpriced. They'll sell maybe a million combine of this. Galaxy Nexus was priced at $399 and only sold few units. Can anyone say why the S4 spec says it uses the Snapdragon S4 Pro instead of the 600? Did Sammy pull a fast one on everyone hopng to get one of these unlocked phones by provided a more limited device while stil calling it a Galaxy S4 ... or did they just make a mistake when posting it? i wouldn't get either of these as i'm sure there'll be Google Edition ports being done for the consumer editions. HTC is even rumored to make the Stock 4.2.2 ROM available to download themselves. The play page for the GE S4 says it doesn't have 1700mHz for 3G, if there is no AWS, its a complete crapshoot for the T-Mobile users. It does have it. They omitted it by mistake. Any link to the confirmation? 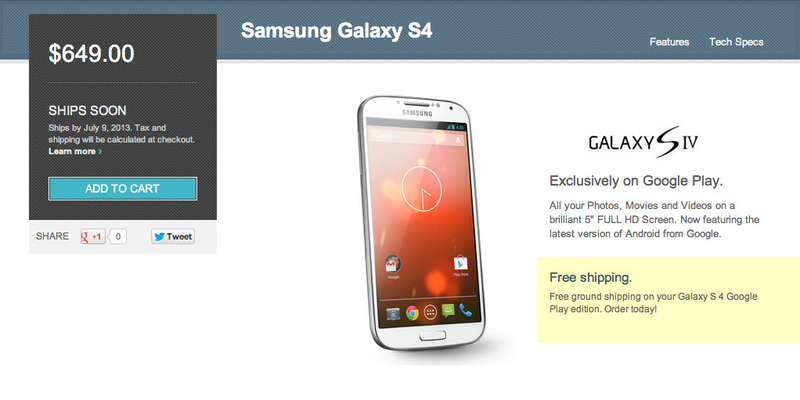 I was ready to pull the trigger on the GS4 GE but this was holding me back. hmm nice s4 for me if it supports att lte. AT&T has LTE on bands 4 and 17 (700/1700/2100 MHz), the GS4 GE supports 700, 850, AWS, and 1900. AWS includes 1700 (uplink) and 2100 (downlink), so you could use the GS4 GE on AT&T's LTE network, unless I'm mistaken. The Verge has stated that both phones use the same processor as their "skinned" counterpart.